Today we are interviewing J.E. Plemons about his YA novel, "Last Light Falling - The Covenant, Book I." Describe the plot of your book in a few sentences. For Gabriel and Arena, life has been short of exciting, but when they receive a special letter on their fifteenth birthday, history will forever change. Nations have fallen, economies have collapsed, and half the world's population has been wiped from the earth. The prophecy of the end is near and it's up to Gabriel and Arena to help prepare the world's demise by the wrath of God. Souls will rest in the providence of these ordinary twins put in an extraordinary situation, but when fate chooses them, they will have to accept their destiny changing their lives forever. Who (age, gender, etc) do you think would most appreciate this book? 15 - 25 year old girls. Although young adult novels are becoming more and more popular with the adult crowd, it's hard to pinpoint the general audience, but yes, teens will love it. What inspirations contributed to this book? This story has turned into something bigger than what I had planned. 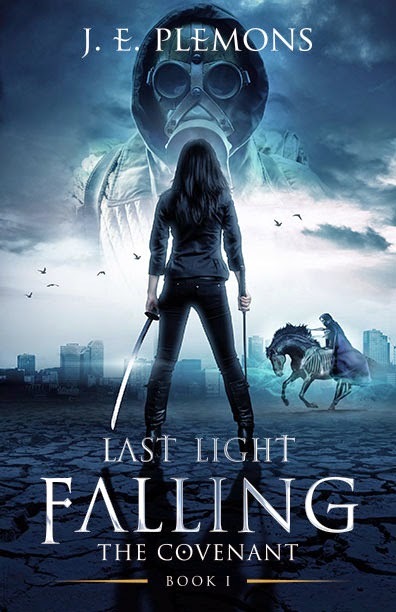 After a brief stint negotiating a deal with a well-respected Marvel comic book artist, I finally decided to shelve the idea of the Last Light Falling comic book and focus solely on the novel, which I began in March of 2012. My original inspiration behind this series came from this comic book concept about two unlikely heroes battling the normal mundane trials of teenage experiences in high school. But the true inspiration falls back to my very own kids, Gabriel and Mikaela—my two unlikely heroes in this novel. The characters created are solely based on my children's personalities, and it's scary how close they really are. No doubt, Arena. It was so easy to create and develop her character because I mirrored her traits and personality from my own daughter. But the mundane trials she grows up with and faces in the story are based on my own personal experiences. I just thought it would give the novel better appeal if I vicariously lived them through this 15 year old girl. Always a great question. Since I was a wee lad. I used to storyboard all the time when I was six years old, but when the Choose Your Own Adventure books became popular, that's when I got serious about writing short stories. They were completely nonsensical, but so much fun to dream about. I'm a daydreamer by heart. Problem is, I don't know when to stop. That's a loaded question. I don't really have a favorite, just one or two that are sentimental for the memories they brought me. To Kill A Mocking Bird was probably one of the first stories that made me sad to read, but really helped me understand a character's real struggles. I really got so much from that book, but didn't realize it until much later in life. And of course I fell in love with C.S. Lewis books in the sixth grade way back when. The Hobbit changed me when I read it for the first time in the 7th grade. What genre do you read most frequently? Young Adult generally, specifically books with believable characters struggling with real problems. I have a bit of a twisted sense of humor and am attracted to books that are unpredictable. Psychological thrillers are my favorite. My stories have become less linear and my characters are much more likable. They have purpose instead of just existing to exist. Every detail in my stories is connected in some way. It's those minor scenes or descriptions that play a small role in revealing something completely different and deeper. And many times it happens by pure accident. Dialogue, Dialogue, Dialogue. It can move a story, yet it can slow the prose in profound ways. It's an art no doubt, and I've been trying to craft mine for years. I used to write screen plays, but dialogue in a script is so much different than a novel. Where description moves a story in a novel, it's dialogue that pushes a story in film. Very different, yet both are hard to master. I absolutely detest clichés or tropes. It drives me insane. As a writer, one would assume English was your favorite class in school. If that was not the case, what was and why? English class was natural to me, but it was far from my favorite subject. I don't think I ever completed any homework assignments on time in high school. I was born to be a musician. It's in the blood. My entire family are musicians, so Band was everything to me. I'm a classically trained percussionist/drummer. I'd rather have driven a funky beat than participate in an often uninspired class rendition of Hamlet. Not a big fan. I still like paper in my hands, but I'm also a tech whore, so I'm not completely against it. I get the digital age we live in. It's good and bad. The problem with ebooks isn't with the reader, it's with the authors, or the three million who think they are. I'm glad that writers have the opportunity to share their work, unfortunately it works against us all as authors. Marketing and promotion is ever more as essential than it has been in the past. Because of the massive amounts of self-published work that's out there, the filter has become increasingly clogged with…how should I put this - terrible books. Pardon for the lack of articulation here. I would venture to say 75% of the self-published books out there have either been self-edited, or not edited at all. You'd be surprised. So when readers get a hold of those books that haven't been professionally edited, it taints their sense to browse for other self-published books. And there are some great authors out there that are getting over looked. The invasion of the ebook is the only thing keeping the pompous and pretensions publishes from destroying our egos. Ebooks are needed, but like all new and cool technology, it soon plateaus like everything else, and just becomes a piece of the puzzle. I'm not a full time writer so I'm quite content, but I would like to finish my four book series by the winter of 2015 so I can start on the hundreds of ideas I have just waiting to be written. I'm not in the business to be famous or to get rich. Like I said I'm content. I just like to write. I had my time in the entertainment business with music and film, but that period of my life is gone. If it comes back I'll embrace it, but until then, I'm just going to enjoy the ride. Damn, that makes me sound like an old person. Have your family and friends been supportive of your writing? Absolutely, especially my wife and kids. My kids are always giving me ideas. In fact there are two scenes in book II Into The Darkness that came from them almost verbatim. They watch a lot of indie flicks. My son desires to be a film director. My nine year old daughter is writing her first zombie screenplay. And of course I had to marry an editor, but this was way before I thought I would be an author. She's the first set of eyes that critiques my work, and boy can she be honest. I wouldn't want it any other way though. As humbling as it can be, it makes my manuscript happy, happy, happy for my editor. Is there any aspect of writing you don't like (e.g. editing)? See question above. No matter what I write, I know my manuscripts are coming back from the editor with 10,000 words stripped. I cringe every time I open up the file. But that's what they get paid to do, and very handsomely I might add. Have you ever had writer's block? If yes, how'd you deal with it? If you have not had writer's block, why do you think you haven't? Do you write with a computer, typewriter, or pen and paper? Why do you use this tool? Typewriter…what's that? I actually had to learn on one in high school if that tells you how old I am. The next year we got a "word processors". I jot down ideas on paper at the strangest times. I always carry around a pad and pen in my car. If I'm in a store, I pull out the iPhone. But my computer is my best friend when it comes to exploring the meat of the novel. My keyboard is worn from my finger tips and probably doesn't care that I use him as my crumb disposal. I'm currently working on "Last Light Falling - Kingdoms Of The Ten, Book III." I'm about three quarters done. It's been a long ride with this one, but I'm loving every minute of it. I've vested so much into these characters, I will be sad to leave them when the fourth and final book of the series is over. When I type those two words on the last page, I think I just might cry…hey, real men cry.